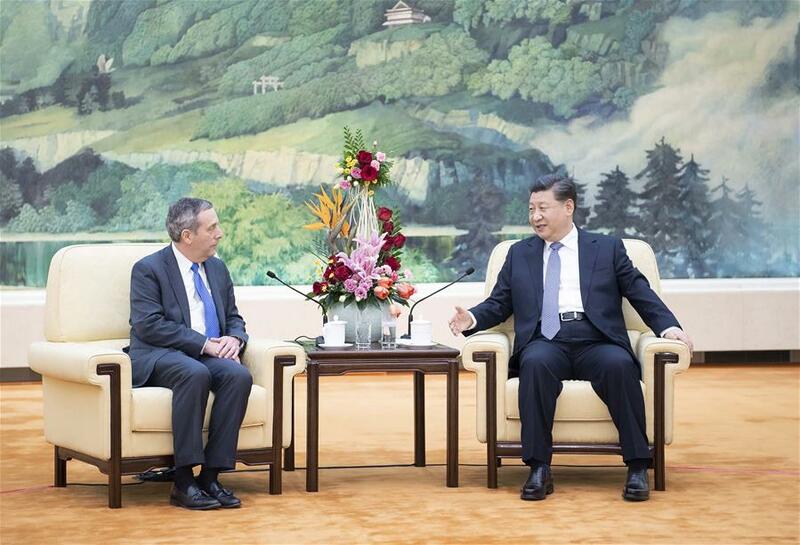 BEIJING, March 20 (Xinhua) -- Chinese President Xi Jinping met with president of Harvard University Lawrence Bacow in Beijing Wednesday and expressed the hope that Sino-U.S. cultural and people-to-people exchanges could produce more positive results. Noting that this is Bacow first overseas visit after taking office, Xi said the tour showcases the importance attached by Bacow to Sino-U.S. education exchanges. Xi said education exchanges and cooperation are an important part of Sino-U.S. relations and help enhance the public opinion of the bilateral friendship. China advocates mutual learning, encourages Chinese students to study abroad and supports education exchanges and cooperation with other countries. Xi said that he felt very happy that U.S. President Donald Trump also expressed support for bilateral cultural and people-to-people exchanges and cooperation in their meeting in Argentina at the end of last year. Xi stressed that over the past 40 years of reform and opening up, China's rapid development has also benefited from the improvement of education. China is committed to advancing the modernization of education and making its education system satisfying for its people. "We will expand the opening up of education, strengthen exchanges and experiences sharing with countries around the world, and jointly promote the development of education," said Xi, expressing the willingness to conduct more extensive exchanges and cooperation with U.S. educational and research institutions such as Harvard University. Bacow said he is visiting not only as the president of Harvard University but also as a representative of U.S. universities to promote education exchanges with China. He said maintaining and deepening exchanges and cooperation between the two countries' education and cultural institutions is crucial to promoting U.S.-China relations in the long run. Hailing the popularity of the Chinese language at Harvard, Bacow boasted that Harvard has a large number of Chinese students. Bacow said it is admirable that the Chinese government attaches great importance to higher education and makes huge efforts in this regard, noting that Harvard will continue to promote exchanges and cooperation with Chinese educational and scientific research institutions.